If the upcoming apocalypse is caused by anything other than zombies, Sean Page is going to be crushed. The guy spends so much of his time writing about every conceivable zombie scenario, especially concerning his homeland of Great Britain, that it would be crying shame if we weren’t able to put his life’s work to good use. Despite having been a small part of his recent project (p 85-86),War Against The Walking Dead, I had no idea what Sean was attempting with his latest zombie project. I didn’t have a clue that there would be so many influential zombie authors involved, including a foreword from Eric S. Brown. I thought it was just going to be a follow-up of some kind to The Official Zombie Handbook by The Ministry of Zombies. I couldn’t have been more off the mark with that assumption. I read zombie literature every single day, and yet I’ve read nothing that could even come close to the brilliance of this particular compilation by Sean Page. I was absolutely floored by the magnitude of this book. It’s no wonder it took him over year in the making. Calling War Against The Walking Dead a guide is a serious disservice to the voluminous information so meticulously organized; calling it fiction seems just as egregious, when you consider the months of research that is crafted within the pages. Seriously, comparing the ZSG to WATWD is like comparing a stone tablet to a Kindle. Page has successfully created the most unique zombie community experience available in book form; the text is authoritative and comprehensive, supported with maps, charts and other illustrations. WATWD is an all-embracing, high quality chronicle that will have zombiephiles around the world rethinking the zombie prose. I can only hope that the zombie cinematic community takes note as well. Indisputably, Severed Press, the Melbourne based publisher, has definitely made a name for itself with the release of this monumental addition to zombie literature. 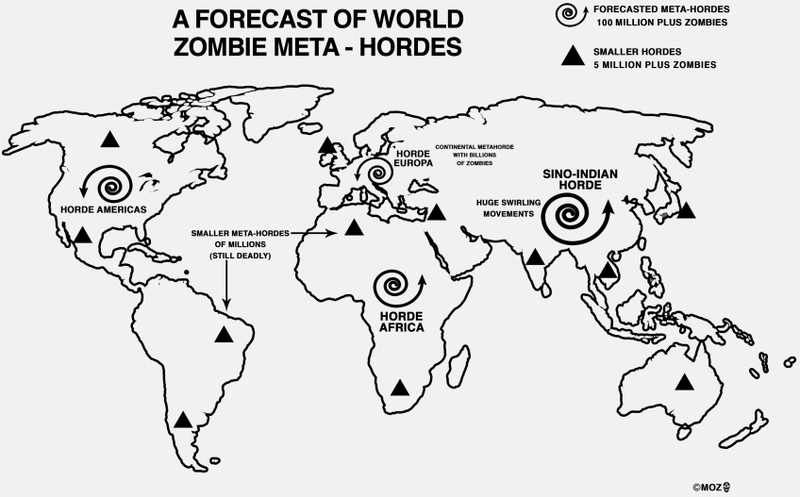 Sean Page has essentially written a zombie atlas, so I thought it was about time to give him his fifteen minutes at The Zombiephiles. How difficult was it to write War against the Walking Dead? How does that experience compare to The Official Zombie Handbook (UK)? 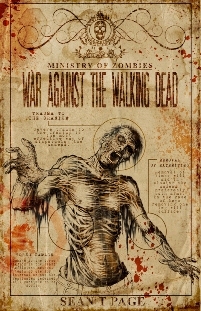 War against the Walking Dead was a much larger project; it involved wider consultation with zombie experts around the world. A big difference is that it’s not about survival; I think we have good coverage there; this is about conducting a war against the zombies. For me, this was a critical area we lacked information on – how do you create a militia, what other survivor groups will be out there, what will happen to the zombies after a few months or years. This is the research I wanted to put into War against the Walking Dead. I asked myself the question, you are in your fortified home, you’ve got supplied, you’ve survived the outbreak and it’s Day 90 – what next? How do you re-build society? Where do you start? I hope this is something new – the science is certainly something new – particularly the research around meta-hordes. Could you give us some background info about Severed Press? How did you hook up with them? Severed Press is an amazing dynamo of a small publisher. They put out a variety of apocalyptic fiction, much of it zombie-related, with a mix of new authors and really well-established players like Tim Curran. The best thing about dealing with Severed Press is it’s all about the story with them; they are true zombie horror fans. How do you research a post-apocalypse scenario with the undead? How did you go about selecting your experts? In some cases it was easy. The USA has some experienced experts as does Australia. Some of these guys are pioneers in the field. The real challenge was dealing with the Chinese, Russian & other official sources. They can be a nightmare of paperwork. One thing that frustrated me was that I couldn’t get any more information on the Chinese Red Army and their preparation to fight the zombies. In some areas, I had to draft in experts, for example, on firearms and microlights. Others, it was just hard research. Has the ever-growing zombie genre affected you as a writer and a reader? I suppose it has. There is a lot of great stuff out there and some not so great. It’s become more of a challenge to tell which is which. The anthology market is also packed. I think it’s a great time for readers but you have to be selective. I’ve also developed a taste for flash fiction recently. Sometimes folks read my work and think it’s too detailed, too survivalist but that’s my approach…I try to pack as much research as possible in. I try to be honest about what you are going to get in one of my books. Who or what has influenced and/or inspired your writing? I love the classics as well as modern stuff. I’m not a Stephen King fan – in terms of horror it’s Lovecraft for me and Clark Ashton Smith. Modern is Eric S Brown – who is what I would call a writers writer – he doesn’t know how good his stuff is and every book seems to break the mould. I’ve spoken with numerous UK authors that say they have had to edit their writing to appease US readers, especially when it comes to slang. Have you ever had that problem or dealt with a similar situation with US reviewers? I am aware of it and I do try to ensure it makes sense to everyone. It’s tough sometimes and you just don’t realize you are doing it sometimes. Luckily War against the Walking Dead was international so I had input from all over the world. Are you sticking with the zombie genre or do you have other non-zombie projects in the works? I have a couple more zombie projects on the horizon, including a novel which incorporates some of the scenarios and characters from my Ministry of Zombies work. I love short stories and the ones I write are more pure horror than zombie. Something I haven’t told people before is that virtually all of my short stories are linked to something called the ‘cult of the dead’. So, in the future, I would like to pull these ghastly tales together!